Here is another inspiration from our cruise a few weeks ago: Gazpacho, a delicious chilled soup that is refreshing and requires no cooking! Even at our 7,500 foot elevation, we have seen temperatures in the 90’s and the daytime temperature inside the house has reached 85 degrees! We don’t have air-conditioning so as soon as the sun wanes we open all our doors and windows to capture some of the cool air. This is the perfect recipe to help cool things off. 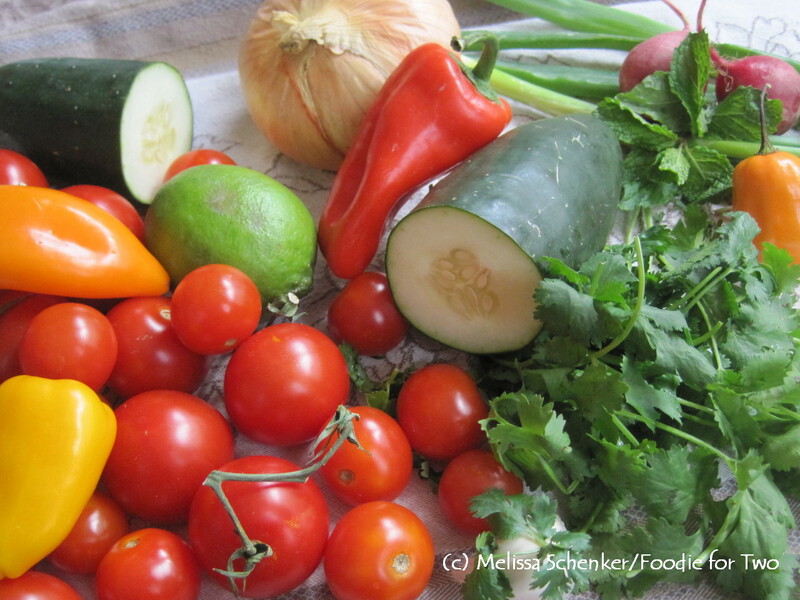 Gazpacho hails from Spain and is made with uncooked tomatoes, cucumber, sweet onion, bell pepper, garlic and cilantro. Tomatoes are the star ingredient, a great use for the delicious summer bounty from your garden or farmer’s market. Out of season, my favorite go-to is the vine-ripened variety. This is a super easy recipe that can be made with many variations: for example, if you don’t have cherry tomatoes add some of your favorite Bloody Mary mix! I like my gazpacho more pureed and smooth rather than chunky, and then I add a chopped vegetable garnish at the end for a little crunch. And I like to peel the cucumbers because they make the soup darker, which you can see from the photo because I forgot to do that! The garnish has scallions, radishes, habanero and mint, which adds a bright, fresh flavor. The soup also tastes better if made one or two days ahead of time because it allows the flavors to develop and mingle. Another delicious idea: serve the gazpacho in a shot glass for a mini appetizer – top it with some vegetable garnish and add some chopped, cooked shrimp or some diced avocado to finish it off. If you want to go for a snazzy presentation to impress your honey (or guests), transfer the soup to a fancy pitcher, add one tablespoon of the garnish to the bottom of each cup or bowl and pour the gazpacho table-side. You’ll look like a pro! Soup: Cut the tomatoes (except the cherry tomatoes) in half and remove the seeds and pulp with a spoon; discard seeds and pulp. Chop the tomatoes into large pieces. Add all the soup ingredients to a food processor or blender and blend until smooth and finely chopped, about 1 minute. If you like your soup more chunky, blend for less time. Transfer soup to a bowl or large measuring cup and chill for at least 4 hours, or overnight. 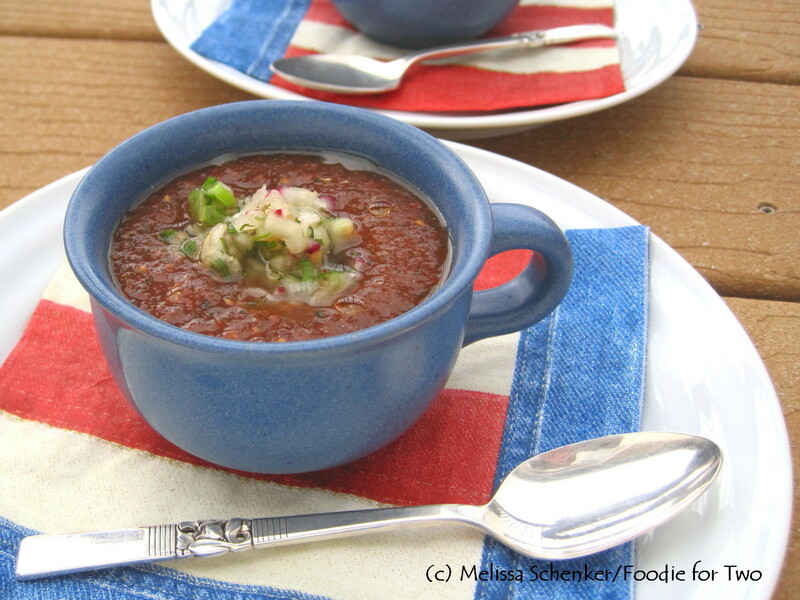 Gazpacho is best the next day; if possible make one day ahead to let the flavors develop fully. Garnish: Add the scallions, radishes, habanero, cucumber, mint, salt, pepper and olive oil to a small bowl and mix well. Assemble: Serve soup cold – In a small coffee cup or bowl add about 3/4 cup of soup, top with 1 tablespoon of garnish mixture and a small drizzle of extra virgin olive oil. A photo memory from the cruise a few weeks ago…..After the zipline in Jamaica, in Chakka Park and enjoying authentic Jerk chicken for lunch. 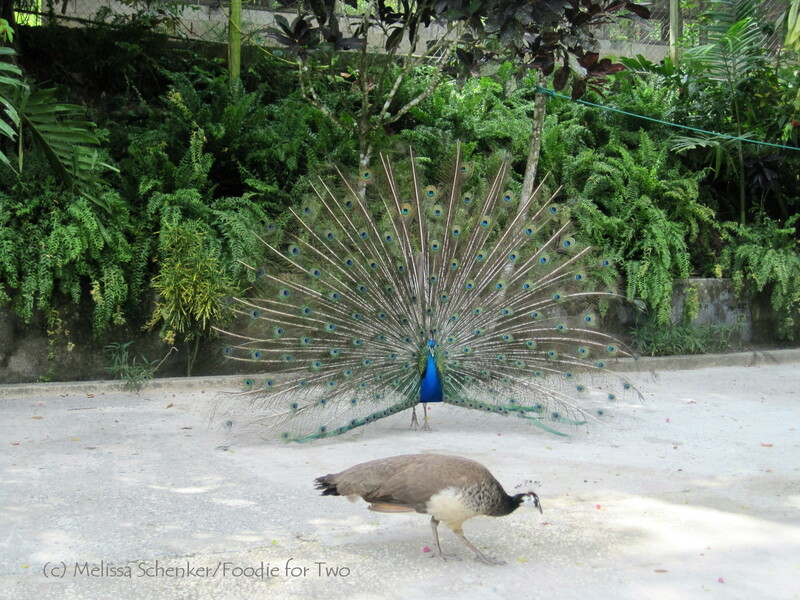 The male peacock, with his wings spread, tried his best to get the female’s attention while we watched from the picnic bench. Believe it or not, I am still celebrating my birthday from earlier this month (lucky me)! My gourmet friends, Holly and Kurt, invited us over for a belated birthday celebration last weekend and she served the coolest appetizers: Vegetable Shots. 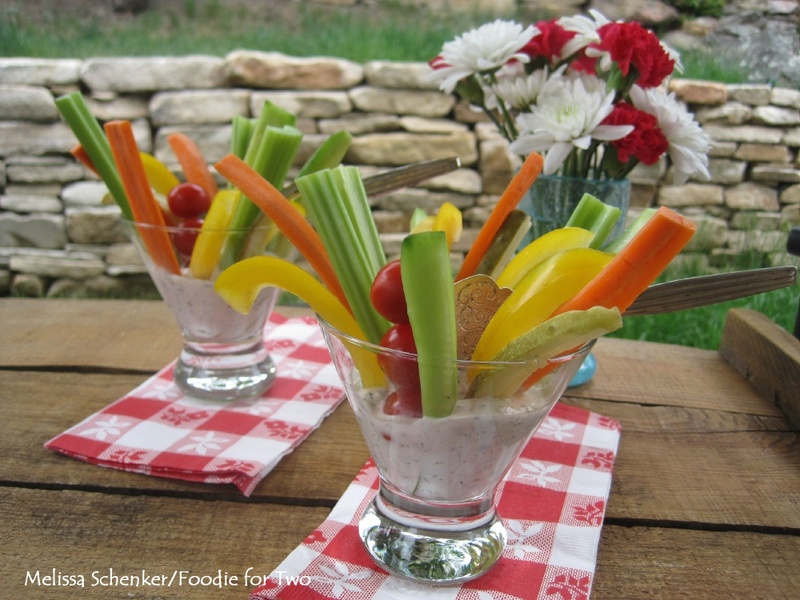 They were strips of yummy veggies in a glass with ranch dressing at the bottom. Holly got the idea from the magazine “Martha Stewart Living”, where they had different kinds of veggies in glasses on ice. Holly’s set up was much more elegant than mine with silver rimmed glasses passed down from her mother, and beautiful glass-beaded cocktail spears that held the cherry tomatoes. She used a gluten-free ranch dressing but here I made my own variation with a creamy herb peppercorn. Any vegetables that you like can be used for this fun and unique appetizer. I liked what Holly included: peeled cucumbers, good pickles, carrots, yellow bell peppers and cherry tomatoes on those pretty little skewers. We used to have a gourmet dinner group going and Holly and Kurt were involved; they both are excellent cooks. Holly is one who pays attention to detail and sets a beautiful table that makes you feel like a special guest. It’s always so fun to go over to their house for dinner. The “boys”, Jensen and Cole, filled us in on swim team and teenage life. The Bergman’s prepared a delectable feast for us and we would go back anytime! The veggie shots have some dressing in the bottom, for sinful dipping. 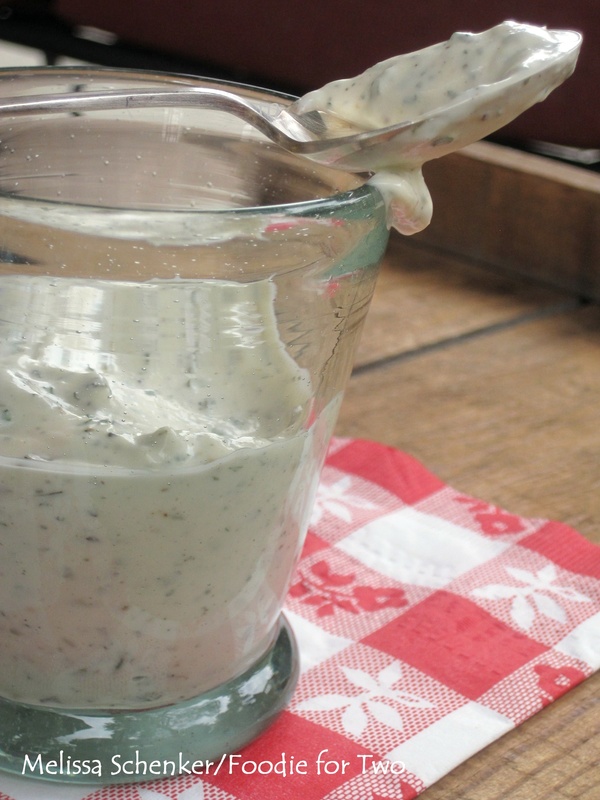 My favorite is ranch but I whipped together my own version with a slight variation – a creamy herb peppercorn. It has mayonnaise, fine herbs (dried tarragon, parsley, chervil and chives), garlic powder, onion powder, fresh cracked pepper, milk, salt and pepper. The consistency for this recipe is thicker for dipping; to use for a salad dressing, add 2 to 3 teaspoons more milk to thin out. 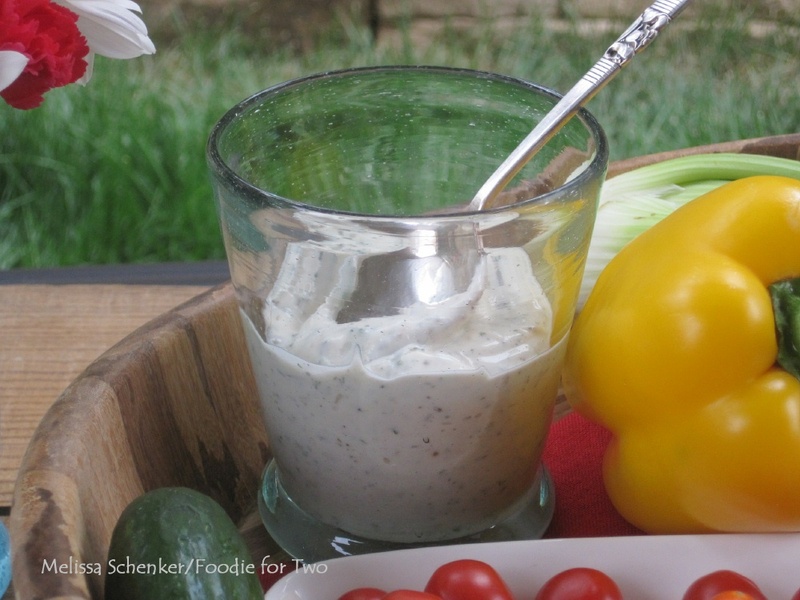 For a lighter version, sour cream or Greek yogurt can replace one quarter cup of the mayonnaise. And leftover dressing can be used for tuna salad or as a sandwich spread. 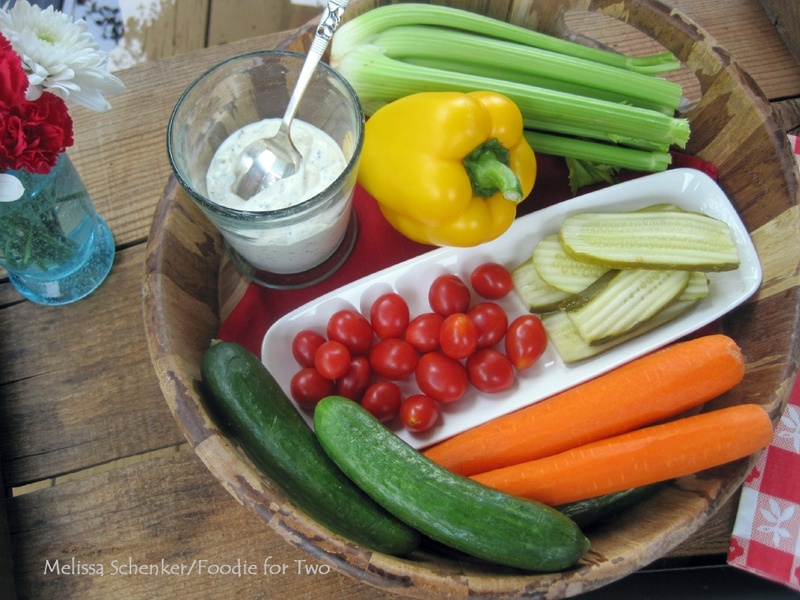 These vegetable shots are a great choice for a simple and elegant appetizer during the upcoming July 4th weekend. They are different, delicious, refreshing and fun. Plus, everyone gets their own glass, so let the double dipping begin! What’s next? I’ll share recipe ideas (of course, dessert) for the upcoming holiday weekend. Eat well and share the love! Add all ingredients to a medium bowl and whisk together until well combined. Peel and slice the vegetables and skewer tomatoes (and olives if using). If you don’t have any fancy skewers or tooth picks, use a sprig of rosemary to skewer the cherry tomatoes. In the bottom of two small glasses, add a good dollop of dressing. Arrange the vegetables upright in the dressing. Add a small amount of dressing in the middle and add the tomato skewers (and optional olives if using). Keep chilled until served.